DC-Laus Deo: In the Cazzo of Petrine Obscenity? When Pope Francis was giving his Angelus blessing and homily at St. Peter's Square, he made a slip of the tongue whch sounded obscene to native speaking Italians. The offending word is "cazzo" which is Italian for the male appendage, but it is commonly used as a synonym for the "F" word. His Holiness obviously meant to say "caso" which is example in this instance. Philologically, the mistake is easy for a Spanish speaker to make. To me, what is really obscene is that the chattering class is more intent on snickering over something that sounded dirty rather than concentrate on the message of sharing rather than not hording riches. 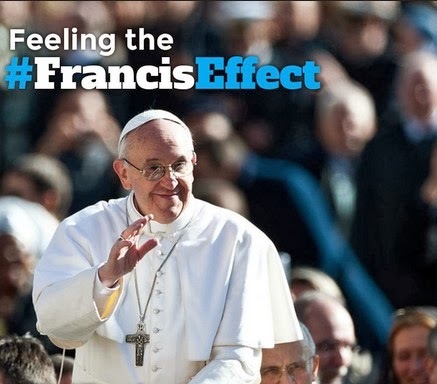 It seems that the Francis effect can only go so far. After the Cazzo kerfluffle went through the press cycle for a day, Pope Francis used Twitter to share his humble mea culpa.